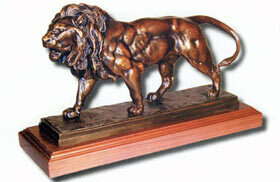 This bronze statue is Wally Shoop's replica of the famous lion bronze done by Bayre. This statue is handmade in the United States and cast in the traditional Lost Wax Casting Process. This insures a quality bronze sculpture that may be passed down from generation to generation. This bronze statue outlines all the strength and power of the lion. To learn more about Wally Shoop, click here.